We're a team of knowledgeable, dedicated and compassionate professionals working to provide the highest level of veterinary care for your pet and exceptional service for you. Our director, Mark S. Davis, D.V.M., established the practice in 1986 as a full-service veterinary hospital. From the moment you enter South Fork Animal Hospital, you can sense we do things differently. Soaring windows in the waiting area and bright, clean odor-free public spaces and treatment areas reflect our emphasis on creating the healthiest environment for your pet. Careful scheduling and our efficient office visit process ensure waiting time is minimized. 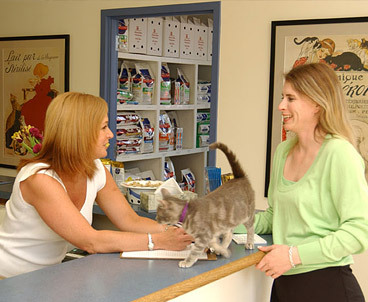 Our on-site pharmacy conveniently fills your pet's prescriptions quickly and accurately. Additionally, we provide complete instructions for home care when your pet is released, and we routinely call your home to follow up on your recovering pet. If your pet has a serious medical problem, you have the comfort of knowing we have the knowledge, experience and technology to deal with complex veterinary cases. As the only AAHA-accredited veterinary hospital in East Hampton, we are regularly visited by AAHA Practice Consultants to ensure we continue to meet the association's stringent requirements.